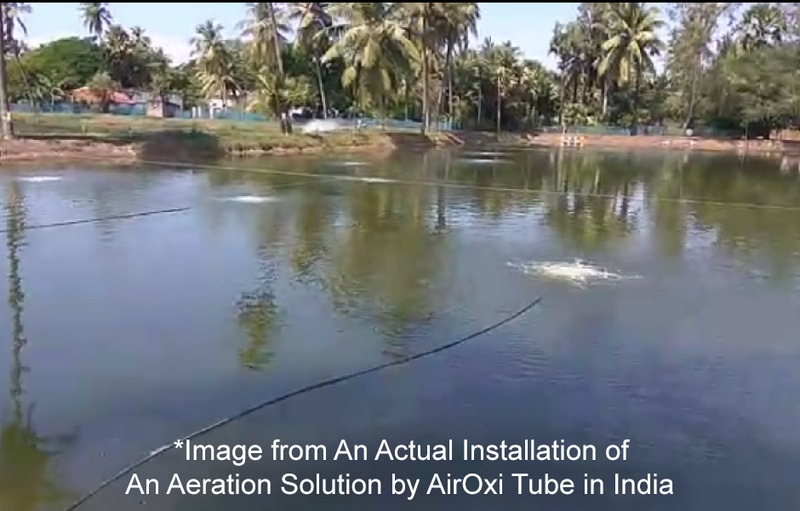 Aeration tube is a highly efficient method of increasing Dissolved Oxygen in ponds used in fish farming and aquaculture. There are many ways to increase dissolved oxygen in the pond. Most common is to splash water using paddle aerator or spiral aerator or any other form of surface aerators. But these machines are made for moving water and not for increasing aeration or Dissolved Oxygen. So most of the power is spent on moving the water, and not increasing DO through aeration. The air is pumped at a depth of 1 mtr below the surface so it gets that much time to rise and dissolve oxygen in the water. The aeration tube ensures very fine micro bubbles , increasing the surface area of the bubble , hence allowing for high transfer of oxygen from air to water. It is almost noise free and does not disturb aquatic life so it can also be used during feeding time. The SOTR – Standard Oxygen Transfer Rate – using aeration tube and blower is almost 3 times that of a paddle aerator. So if using 1 HP paddle aerator, DO can be increased from say 4 to 5 mg /L in 1 hour, the same result one can achieve in 20 minutes using aeration tube. The SAE – Standard Aeration Efficiency – is almost 3 times that of paddle aerator. So for instance if you need 3 HP of power using paddle aerator to increase DO from 4 to 5 mg/L, you can achieve the same with aeration tube but with 1 HP or less power. These benefits are slowly being accepted by aqua-culturists, however they hesitate to use the tube for fear of algae and pond waste sticking to the tube, hence clogging them. These fears have a reason behind them – because if not used properly and without precautions, tube can be clogged. Also regardless of how well one takes care of the tube there will be algae in the pond which will adhere to the tube, just like it will adhere to everything else in the pond. Always use the tube at least 3-4 hours a day. This will ensure that air blows away any matter sticking to the tube. The power consumption is very less, and a high DO is always good for the shrimps. Even if you feel natural DO is already high, use the tube for 3-4 hours a day. Once in a month, rub the tub with a rough cloth or wire brush or steel wool to scrub away any matter stuck to the tube. If you see algae on it, you can also use bleaching powder solution to clean the tube. If the build up of scales and algae and waste is very high, you can scrub once a month with wire brush. After the season is over and you need to store the tubes, you should store them in a shaded area, after 3 steps of cleaning. If the clogging is high, then dip in diluted bathroom or tile acid for a few minutes to thoroughly clean it completely. And if your pond has high algae, you can also use the new Algae Resistant Tube (product code AO125250-AR ). 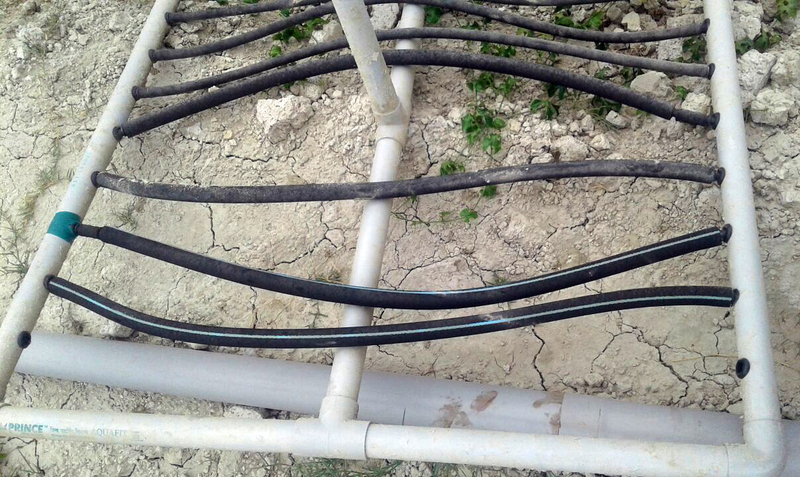 This is a special tube for ponds with high algae content. The additives are based on silver nano technology and hence are safe for use in aquaculture ponds. They do not release any chemicals in the pond. Instead the tube additives ensure that less algae sticks to it. It will not be totally algae free, but the build up will be much slower than regular aeration tube. So if a regular tube would have algae coating in 1 month, the algae resistant tube will take at least 3 months to get that kind of buildup. And that will ensure you do not have to clean the tube mid crop. 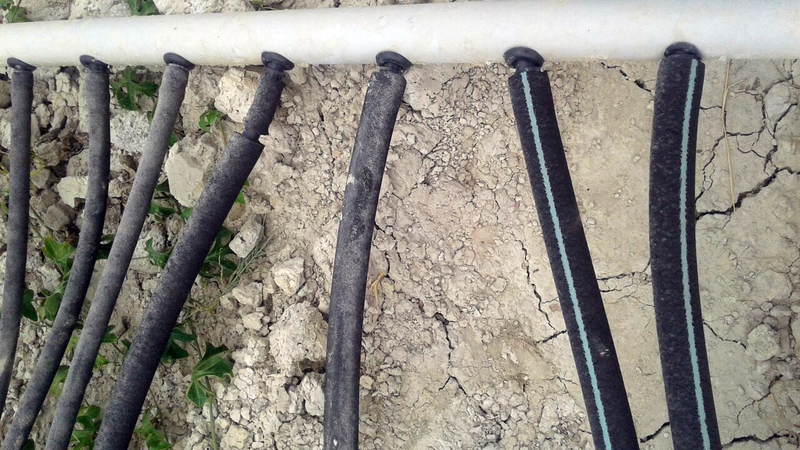 For more about Aeration Tube Maintenance click here.